Perfect for our remodeled bath room! I absolutely love this shower door. I had my bathroom gutted and remodeled and was in search for the perfect shower door. I fell in love with how the frameless DreamLine shower doors look. It's a very nice, sleek and modern style. The glass is thick and the hardward is all great quality - beware that the shipment is large and extremely heavy with the glass doors. It looks beautiful installed and I was thrilled to get it at such a great price! Just installed these doors on my newly remodeled shower. They look fantastic! Just be aware that your walls have to be completely plumb, and you have to be really good at precise measuring if you're going to install them yourself as there are no wall tracks to provide forgiveness or cover for any out of plumb condition or mis-measurement. The instructions are clear and easy to follow. Great price, fast shipping and quality product. Thanks. I do wish the head rail was a little taller though. The this glass door are made with all quality parts. The installation pricess require a professional for sure, it took us 6 house to install, make sure that the installation are done with at least 2 people. I definatly recommend these shower door, the price and quality are great. The door glide smooth when opening and closing them. The glass also is easy to clean from spotting. The best part is that they are frameless. This frameless shower door is high quality, pretty and was easy to install. It worked perfectly in our master bath remodel. Ordering this from Overstock saved us money bc we caught it on sale and had a coupon. And although initial delivery said 3-4 weeks, ours arrived in 1 1/2 weeks. It was very securely wrapped and arrived on a pallet. Be aware the delivery is from truck to sidewalk - NOT in the house. Prior to the delivery persons departure we had to basically unwrap/unpackage it so that we could inspect it to cover ourselves for any damage that may occurred during shipment. As I said, great packaging. Takes at least 2 people to move it into house. I have always been satisfied with Overstock and this purchase reinforces my recommendation of Overstock as a great shopping source. I highly recommend this frameless shower door. Nice shower door. Extremely heavy packaging though & you will need assistance moving this one! Doors are thick & sturdy, however one side of ours will not slide completely closed regardless of which way you slide the doors. Luckily it is the side where the shower head comes out so not too much water escapes. I ordered this for our guest bathroom, as we decided it was more practical to have just a shower installed and not a shower/tub enclosure. The door opens from both ends and that is great. It arrived with a small knick in the glass edge, but we already had it up so we didn't make a fuss. It's not as smooth running as the one in the master bath, but works well for it's purpose, as it's only used occasionally. this is a great shower door to have. it is so nice to be able to open the side where the shower controls are, to turn on and get hot. yet you can use the other side to exit out of. The glass door was well packed and no damage for a very heavy package. The installation was pretty easy but it does require 2 people as the glass doors are pretty heavy. They look great and roll perfect. Makes our newly remodeled bathroom look great. Installed exactly as instructions detail and it leaks at the bottom every shower. We just installed this in our guest bathroom and love it. It wasn't the easiest to install and needed 2 people, but well worth it. It feels sturdy and looks fantastic. Great quality and would recommend. Assembly was easy and bathroom look great. These are beautiful doors which is why I ordered them. The first time they were shipped, they were dented and had to be returned. The second set did not have some sort of "this side goes in" sticker so THEY had to be returned. Waiting for shipment #3 and am hoping the 3rd time is the charm. This is ridiculous. (My purchase will not be verified b/c my contractor ordered these doors, but my gripes are legit). Update on November 21st - I STILL do not have the replacement doors. "What is the glass thickness of the doors?" The glass thickness for this is approximately 8 mm. "Will this door fit a 60 inch opening?" Yes, this will work in a 60-inch opening. "Can this be curbless? Thank you." Yes, it can be curbless. 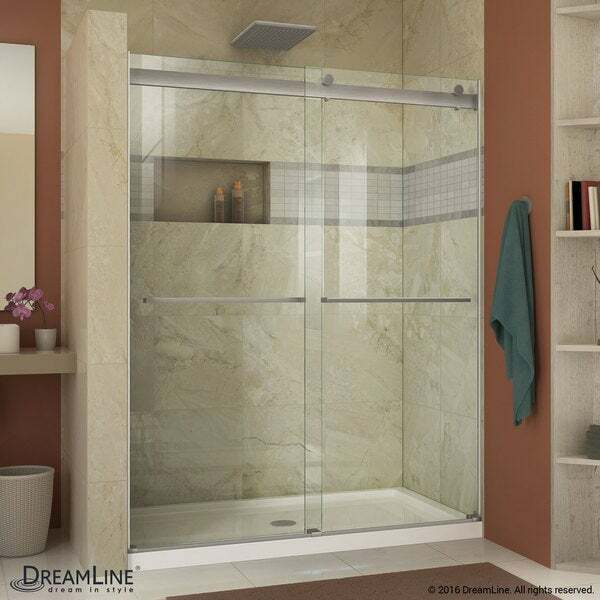 "can you use this door on a shower encloser or does it have to be tile wall"
All DreamLine shower doors and enclosures require smooth, solid finished walls, true 90° angles where the wall meets the threshold, and finished walls that are at least as tall as the shower door or enclosure. If the walls of your enclosure have any give or flex to them when you push on the wall, most likely there is a pocket of dead space behind the wall and the wall is not solid. Please make sure that your shower meets the requirements for installation before making your choice. "Does this come with the option of obscure or frosted glass"
I'm sorry, the Essence is only available in clear glass at this time. We do offer the Encore SHDR-166076F-01 model in a frosted glass. Thank you for your interest in DreamLine and for shopping Overstock. The product has good reviews, looked nice and was a reasonable price! "My shower is 52" wide. Will this door fit in?" I'm sorry but this door will fit an opening of 56-60". Cutting it down to 52" is not recommended. I would recommend the Encore model SHDR-1654760-01.